Configure your initial field service settings. Create users for field service. Assign your users to field service resources (mobile workers). To get up and running, you first need to enable Field Service Lightning and take care of a few important settings. To follow along in Trailhead, create a new Trailhead Playground. Scroll to the bottom of this page, click the down arrow next to Launch, and select Create a Trailhead Playground. Yes, we really mean a brand new Trailhead playground! If you use an existing org or playground, you'll run into problems completing the challenges. From Setup, enter Field Service in the Quick Find box, then select Field Service Settings. Click the toggle to enable Field Service Lightning. Once Field Service Lightning is enabled, adjust the settings. If you want your workforce to stay informed about the work they’re assigned to do (and that’s a no-brainer, right? ), under Notifications, select Enable notifications. Under Auto-Created Service Appointments, set the Days After Created Date to 3. This means the due date on auto-created appointments is three days after the created date. 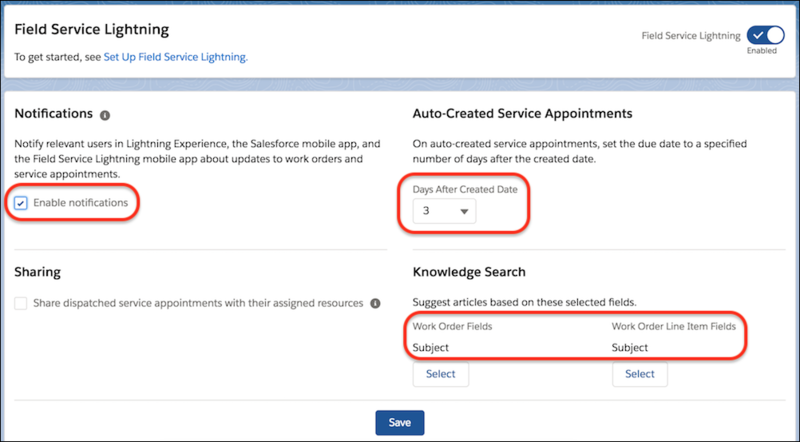 For both work orders and work order line items, make sure that the Subject field is selected as the field to search when suggesting articles from Salesforce Knowledge. Now Field Service Lightning is enabled in your org. You’ll need some helpers to get your mobile services off the ground. You already have one, YOU. Because only two Salesforce licenses are available in developer orgs, you must use the system administrator's profile (that’s your profile) to create one field service user. Look at all the hats you can wear! You’ll create a second stellar mobile worker as part of the hands-on challenge for this unit. Adjust your profile to fit a field tech out of New York. Click your name in the user list. Click Edit, then change the following information. Ensure Service Cloud User is selected. This label varies depending on if you’re in daylight or standard time. 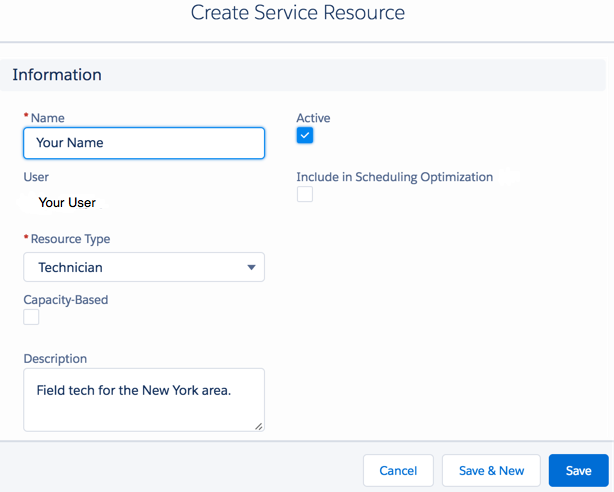 You now have users you can assign as service resources so they have access to the core field service features. Make yourself a service resource so you can bring service to your customers. From the App Launcher, enter Service Resource in the Find an app or item box, then select Service Resources. For Name, enter your name. For User, use the lookup field to select yourself. The user doesn’t have to match the Service Resource name. Use the Resource Type dropdown to select Technician. In the Description text box, enter: Field tech for the New York area. If you get a message stating, “This page isn't available in Salesforce Lightning Experience or the mobile app”, you can ignore it. Now you have a service resource record in Salesforce for your mobile worker (in this case, you! ).